Biomes are the world's major habitats. These habitats are identified by the vegetation and animals that populate them. The location of each biome is determined by the regional climate. Deserts are dry areas that experience extremely small amounts of rainfall. Many people assume falsely that all deserts are hot. This is not the case as deserts can be either hot or cold. The determining factor for considering a biome to be a desert is the lack of precipitation, which can be in various forms (rain, snow, etc.). A desert is classified according to its location, temperature, and amount of precipitation. The extreme dry conditions of the desert biome makes it difficult for plant and animal life to thrive. Organisms that make their home in the desert have specific adaptations to deal with the harsh environmental conditions. Deserts are determined by low amounts of precipitation, not temperature. They typically receive less than 12 inches or 30 cm of rain per year. The driest deserts often receive less than a half an inch or 2 cm of rain per year. Temperatures in the desert are extreme. Because of the lack of moisture in the air, heat quickly dissipates as the sun sets. 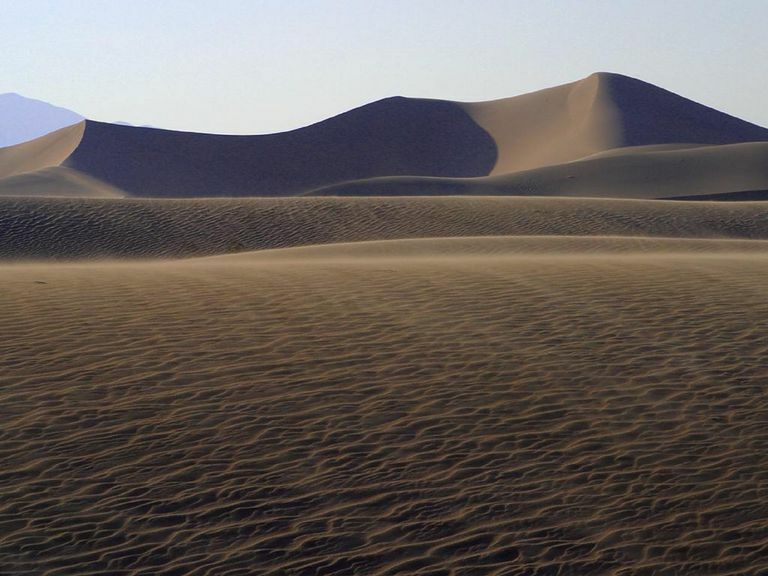 In hot deserts, the temperatures can range from above 100°F (37°C) in the day to below 32°F (0°C) at night. Cold deserts generally receive more rainfall than hot deserts. In cold deserts, temperatures in winter range between 32°F - 39°F (0°C - 4°C) with occasional snowfall. The largest desert in the world is the continent of Antarctica. It spans 5.5 million square miles and also happens to be the driest and coldest continent on the planet. The largest hot desert in the world is the Sahara Desert. It covers 3.5 million square miles of land in North Africa. Some of the highest temperatures ever recorded were measured in the Mojave Desert in California and the Lut Desert in Iran. In 2005, temperatures in the Lut Desert reached a sweltering 159.3°F (70.7°C). Due to very dry conditions and poor soil quality in the desert, only a limited number of plants can survive. Desert plants have many adaptations for life in the desert. In very hot and dry deserts, plants such as cacti and other succulents have shallow root systems to absorb large quantities of water in a short time. They also have leaf adaptations, such as a waxy covering or thin needle-like leaves to help reduce water loss. Plants in coastal desert regions have broad thick leaves or large root systems to absorb and retain large amounts of water. Many desert plants adapt to the dry conditions by going dormant during very dry periods and growing only when seasonal rain returns. Examples of desert plants include: cacti, yuccas, buckwheat bushes, black bushes, prickly pears and false mesquites. Deserts are home to many burrowing animals. These animals include badgers, jack rabbits, toads, lizards, snakes, and kangaroo rats. Other animals include coyotes, foxes, owls, eagles, skunks, spiders and various kinds of insects. Many desert animals are nocturnal. They burrow underground to escape the extremely high temperatures in the day and come out at night to feed. This allows them to conserve water and energy. Other adaptations to desert life include light color fur that can reflect sunlight. Special appendages, such as long ears, help to dissipate heat. Some insects and amphibians adapt to their conditions by burrowing underground and remaining dormant until water is more plentiful. Chaparrals: Characterized by dense shrubs and grasses, this biome experiences dry summers and damp winters. Savannas: This large grassland biome is home to some of the fastest animals on the planet. Taigas: Also called coniferous forests, this biome is populated by dense evergreen trees. Temperate Forests: These forests experience distinctive seasons and are populated by deciduous trees (lose leaves in winter). Temperate Grasslands: These open grasslands are located in colder climate regions than savannas. They are found on every continent except for Antarctica. Tropical Rain Forests: This biome receives abundant rainfall and is characterized by tall, dense vegetation. Located near the equator, this biome experiences hot temperatures year round. Tundra: As the coldest biome in the world, tundras are characterized by extremely cold temperatures, permafrost, tree-less landscapes, and slight precipitation. Burton, James. “The Largest Deserts in the World.” WorldAtlas, 20 Jan. 2016, www.worldatlas.com/articles/10-largest-deserts-in-the-world.html. Staff, Live Science. “Where's the Hottest Place on Earth?” LiveScience, Purch, 16 Apr. 2012, www.livescience.com/19700-hottest-place-earth.html.